You just found me, and this is crazy. But here's my signal, so call me Higgsy. 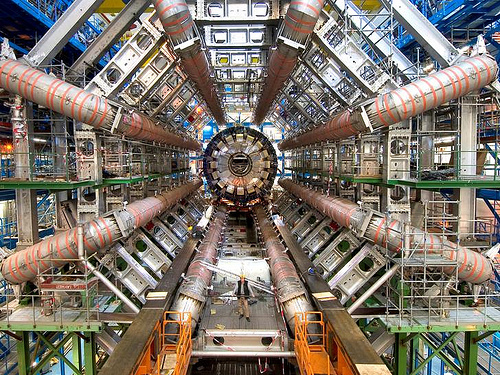 When the Higgs boson was tentatively discovered by those Swiss brainiacs at CERN, proponents of Higgsless models (explanations of the universe that don't rely on that stuffy ol' Peter Higgs or his upstart hypothetical particle) were predictably disappointed. But before Team Higgsless could curse the defenseless scalar particle too loudly, a team of ASTRA researchers discovered a way to make the popular boson even more likable than it already was, assuring that no one could remain angry with it for long. So how did they accomplish such a particulate PR coup? Domenico Vicinanza, product manager at Dante (Delivery of Advanced Network Technology to Europe), sonified the particles' data, converting its very existence into a catchy downloadable .mp3. The resulting song, which you can listen to here, carries what's perhaps an unsurprisingly lively tune that will get everyone from FranÃ§ois Englert to Gerald Guralnik generating non-abelian gauge vector fields to the beat. Domenico Vicinanza explains how something so small and unstable can pack so much boogey. "Sonification worked by attaching a musical note to each data. So, when you hear the resulting melody you really are hearing the data," he said. "In this way any regularity in the scientific data can be naturally mapped to the melody: if the data are periodic (they are marked by a repeated cycle) the sonification will be a music melody which will have the same periodicity and regularity." Now, this habanera rhythm may sound simple to you, but it's actually the product of a massive European high-speed research system that strung together smaller networks (including the GEANT, which offered up 40Gbps worth of processing power) to feed Vicinanza's project the absolutely ginormous amount of computation required to assemble the notes. Essentially, his team used the network to map continuous intervals between data values to create the melody, altering the pitch parallel to the intensity (or lack thereof) of each variable. Each semiquaver relates to an increase of 5 GeV during CERN's tests, which spiked to 126 GeV during the actual discovery. In the song, you can hear this event (about 3.5 seconds in) as expressed by a peaking series of notes: F, C, and E. It's highly doubtful there was any better use for Europe's most powerful super computer network during the window in which this song was so meticulously constructed. Vicinanza went on to claim that "by using sonification, [he was] able to make this breakthrough easier to understand by the general public." I don't know about you, but once I listened through all 42 seconds of Vicinanza's work (bobbing my head all the while), I couldn't help but be struck by the revelation that the Higgs boson is a byproduct of the mechanism by which other elementary particles obtain mass from within a ubiquitous quantum field in open space. It makes me wonder what other complex areas of theoretical physics could be better explained in orchestral form.